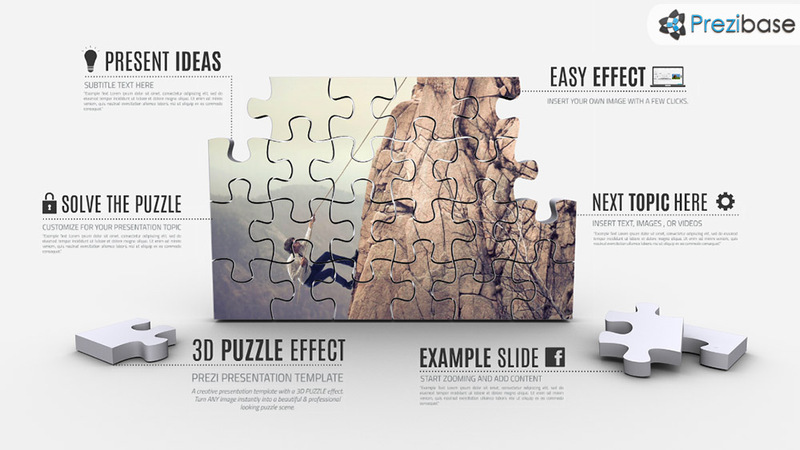 A Creative Prezi Presentation Template with a scattered 3D jigsaw Puzzle effect. Apply the effect to ANY image. Zoom in and present your content details in an infographic style. Create a simple yet professional and clean looking 3D jigsaw puzzle presentation effect. Suitable for many creative presentation topics about “building” a project or assembling a topic or a solution. Present about business or talk about a personal or educational project. Good fun template for presenting to kids but can also be used for a serious topic. Construct your topic, use buildings blocks concept and explain your topic. How to apply the effect: Insert your image into Prezi, move it into place, right-click and choose send to back. This will overlay the image with a puzzle effect. This entry was posted in Best Prezi presentation templates and tagged 3-d, 3d, 3d jigsaw puzzle, 3d puzzle, 3d puzzle create, 3d puzzle effect, 3d puzzle presentation, about, apply puzzle effect to image, building blocks, create puzzle effect, creative, fun, image into lego, image into puzzle, image puzzle effect, image to puzzle 3d, infographic puzzle 3d, jigsaw presentation, kids, play, presentation puzzle, prezi template, professional, professional puzzle presentation, puzzle, puzzle background presentation, puzzle blocks, puzzle mockup, template template presentation.